This is a cute hat, but it is much cuter with a dogs head under it. I designed and made this hat myself in our NW SD USA non smoking home. 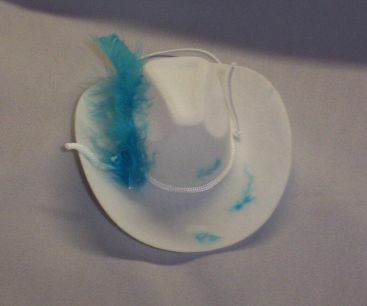 The hat has a piece of adjustable elastic that holds it on the dog's head. I left the elastic long so that it would be long enough for larger dogs. You can cut the elastic to fit your own dog. If you have a dark colored dog you can color the elastic with a permanent marker, just let it dry well before putting the hat back on the dog. This hat will fit a dog, cat, or large rabbit. These items are new and have never been on an animal. Our items are not returnable and non refundable. We have found that folks like to take photos of their animals, win the contest, and then try to return the outfits....I don't think so! !